There is little dispute that the .357 Magnum works. After all, there arent many handgun cartridges that can claim to have brought down moose, elk and even grizzly bears. Most of the other handguns that can lay claim to felling large game are generally considered to be too large and have too much recoil for practical self defense applications. The .44 Magnum would be a good example. (Yes, I know the .41 Magnum has done it, but I have yet to run into a person packing a .41 for personal protection.) Yet, the .357 Magnum has done it while remaining manageable in a personal defense sized handgun. Its a tail kicker, but it has its downside. The sound of a .357 going off is really tremendously loud, even when wearing ear protection. Setting off a .357 indoors without ear protection would most certainly do damage to ones hearing which could be permanent. The muzzle flash is very bright in the dark. For those whose eyes adjust slowly to the dark, the flash could cause temporary vision impairment. Controllability is a concern with the .357 Magnum. It was originally introduced for large-frame guns. In a smaller gun, the recoil is stiff. 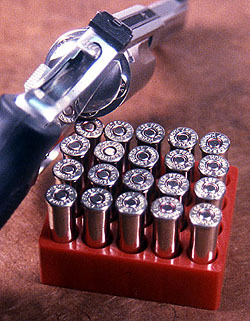 Follow-up shots could be difficult or at least slower as the shooter struggles to regain control of the gun after the recoil. If your hands and arms are very strong, you can control it, but I think that even for a strong person who is used to powerful handguns, shooting performance would be improved by using .38 +p, especially on follow-up shots. Another issue with the .357 is its penetration (no they wont really go through the block of a 49 Buick unless you are firing steel core ammunition, but they did make such a beast once upon a time). A normal 158g .357 hollowpoint can penetrate about a yard in ballistic gelatin. This means its going to slice like a hot knife in butter through walls and siding. It can also shoot through large animals and emerge on the other side with enough velocity to hurt someone else. These are serious considerations which should be weighed before adopting the .357 Magnum as a carry load. For most situations, and especially in an urban setting, a solid .38 Special +p would be a better choice for personal defense. Its more controllable for follow-up shots, less prone to over-penetration, and less damaging to the sensory organs. If, on the other hand, your primary area of operation is rural and wilderness, places where you are more likely to come across a mean pig or a hungry bear than you are the human variety of predators, and be outside during the encounter, the .357 Magnum with its greater power and penetration would be highly desirable. Another of the .357s great strengths, its range, is wasted, and may even be a liability in the urban environment. The .357 is a very flat-shooting cartridge that retains better terminal ballistics at 150 yards than most other personal defense handgun cartridges. The mid-range trajectory of the .357 Magnum at 100 yards is only 3.5. At 50 yards it is only .8. At 100 yards, the 158g JHP .357 retains about 67% of the energy it had when leaving the muzzle (this means 360 foot-pounds of energy with a velocity of 1015 feet per second!). Its easy to see why the range and ballistics of the .357 would be an asset in the country and a liability in the city.